Spring is here, which means in addition to getting seeds started and soil prepped, local farmers are also taking time to go into school classrooms as part of Sierra Harvest’s Farm to School program. Now in its 10th year, this popular program has expanded to include serving residents at the Cascade Senior Center with the Harvest of the Month program, and now farmer visits too! Farmer Emily Koller of Sierra Harvest’s Food Love Farm is doing spring farmer visits at Union Hill School, Deer Creek Elementary, Seven Hills Middle School and Cascades Senior Living of Grass Valley. In the school setting, each lesson is geared toward the next generation science standards (NGSS) for that grade level and is the middle piece of a 3-part series (fall field trip, winter farmer visit, spring field trip) on the topic specific to that grade level. For example, the 2nd grade classes are focusing on how and why seeds travel, so for their farmer visit, they are making seed bombs/balls filled with wildflower and native plant seeds. At Seven Hills, students are learning about the history of seeds and genetically modified organisms in 7th grade science. And after this wet and wild winter, we are all excited for the coming spring. 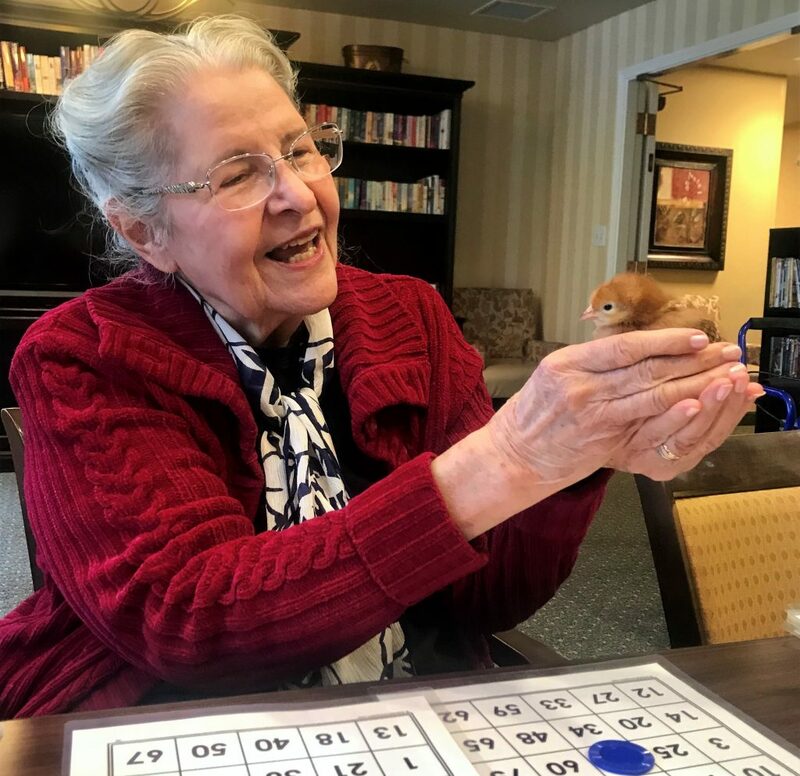 For residents of Cascade Senior Living, Farmer Emily’s visit was especially welcomed. Koller brought fluffy baby chicks that were just one week old, which was a ray of springtime sunshine for everyone involved.